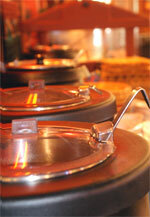 Tuesdays & Wednesday nights – Sam’s “BIG BBQ PLATTERS” for only $12.75 from 4pm to closing. Your choice of BBQ’d Baby Back Ribs, Chicken & Beef Kabobs or a combination thereof. Served with Memphis Mashed Potatoes, creamy Cole Slaw, Onion Rings and fresh Corn Bread. 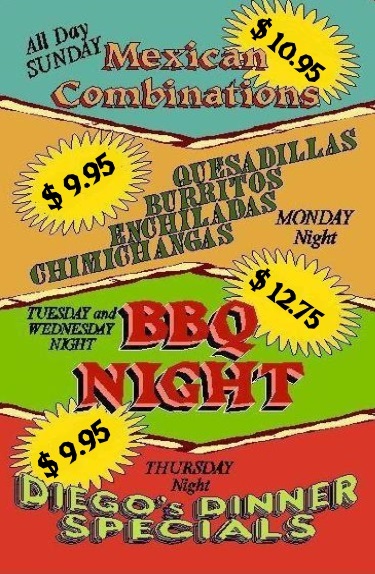 Thursday Nights – Every one of Sam’s Diego’s Dinner Specials is ONLY $9.95. Always something new and delicious that’s BIG on Taste and BIGGER on Value. Available during LUNCH every Monday through Friday from 11:30 A.M. to 3 P.M., our “All You Can Eat” Chile, Soup, Salad & Taco Bar is priced at only $8.50 per person. Sam offers up two fresh Soups daily, Chile con Carne, Corn Muffins, Salad Greens ‘n Dressings, seasonal Fruits… and, all the Corn shell, seasoned Ground Beef Tacos ‘n fixins’ you can muster, including diced Tomatoes, Cheeses, Onions, Olives Jalapenos, Pico de Gallo and Sour Cream. You will also find such items as Potato Salad, Pasta Salad, Seafood Salad or Three Bean Salad, depending Sam’s “creative mood”. Step right up and start fillin’ your plate and satisfyin’ your taste buds. Order a DINNER with a Minimum value of $7.75 SUNDAY through THURSDAY, have your card validated by your server, on your 6th visit, after 5 validations, receive up to $10.00 off the Cardholder’s dinner. Come in for LUNCH MONDAY through FRIDAY, spend at least $6.99 on food for your lunch, have your Club Card validated by your server, on your 6th visit, when you have 5 validations on your card, receive up to $6.99 off [food only] the Cardholder’s lunch. Mention it’s your loved one’s Birthday and receive Sammie’s Signature FRIED ICE CREAM “FREE”! It’s a giant ball of French Vanilla Ice Cream encrusted with our “secret coating”, deep fried and served in a crispy cinnamon tortilla bowl. Topped with Hot Fudge, whipped cream, toasted coconut and a cherry.